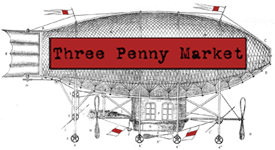 Three Penny Market has a new location at a Farmer’s Market in Provo, Utah! A few months ago, my partner in crime, Shelly, told me she was moving to Utah, but not to worry, she was taking me with her. I thought she was in some strange sort of denial. Then my husband got a job in Orem, and we moved to Utah before she did! Never doubt fate. We looked in vain for flea markets here, and found out they don’t really exist. What they do have is Farmer’s Markets- sort of like a flea market, but you can also buy empanadas, live chickens, and pots of tomatoes! We are loving it. The new location is at Pioneer Park in downtown Provo from 9-2 every Saturday through October. Here is Shelly tidying up.